Recently I found myself saying yes to way too many things in way too short of time. In a single weekend, I found myself driving six hours a day (locally! ), and my margin between commitments was seven minutes. Can you relate? Tell me! Given that this describes the life of most parents I know, the answer is probably yes. And it’s not just us parents. That same weekend, my daughter was so exhausted by her social calendar that she showed the physical signs of exhaustion: her stomach and head hurt, and her anxious thoughts became “stickier,” which means stuff that we normally let go of stick and either bug, worry or anger us. And my son? He slept for 17 hours with only small breaks to eat. 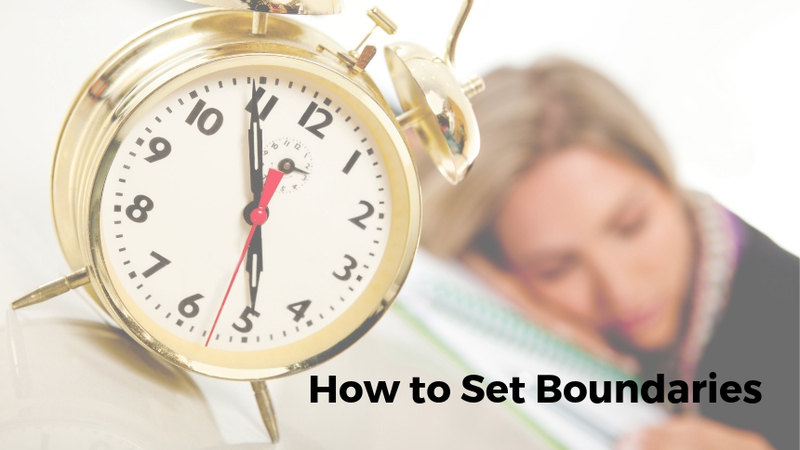 Clearly, we all needed to revisit how to set some boundaries with our time and energy. As a therapist, I know better, but as a single mom, it’s hard. Most of us have trouble setting boundaries for fear we’ll hurt someone’s feelings. Instead, we place our desire to please others above our own needs. Until now! First, wait 24 hours before accepting anything. Give yourself time to think about your response. This also gives you time to say no (for those of us who instinctively say yes). Next, practice honoring your feelings instead of your shoulds. If you really don’t feel like going to your fifth holiday party, give yourself permission not to go. Too often we operate from the shoulds, which may be doing it for someone else. You can always call the host (call, not text!) and express regrets for missing the party. Now that you’ve decided to change your behavior, plan how you’ll say no. In my experience, I’ve often said yes to avoid hurting someone’s feelings. When I plan out what I’ll say, I find ways to do turn down the invitation gently. And finally, if you’re feeling guilty, anxious, or stressed, learn to “ride the wave” until those feelings pass. This is the tricky party. Emotions are like waves in that they come and go, peak and pass. The skill is in letting them run their course without feeding into them with undo attention and energy. One of my favorite quotes is “where the attention goes, the energy flows.” If you put your energy into how guilty you’re feeling about missing the party, those feelings will grow. Make no mistake, setting boundaries is a skill that takes some practice, but by modeling this behavior for our children, we help teach them how to do it for themselves. By setting boundaries, we take care of ourselves and ultimately have more to offer others. So what do you say? Are you ready to give it a try? Hop on over to my Facebook page and let me know how it’s going.